Your marketing automation platform can either hinder or enable your growth. It helps to have all the facts. Differentiating between marketing platforms and making the right software investment for your company’s needs, goals and reporting requirements can be difficult to navigate. In 2018, HubSpot earned G2Crowd's highest satisfaction score out of all 20 top-rated marketing automation platforms on the market, with Marketo trailing at #10. We understand that migrating to a new marketing platform is a significant undertaking — we've helped companies from around the globe successfully manage and execute that process. To help you make the right choice for your business, we’ve taken what we've learned from our experience and compiled it into a comprehensive switching guide. 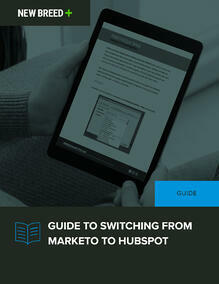 To get your free guide, simply complete the form on the right.